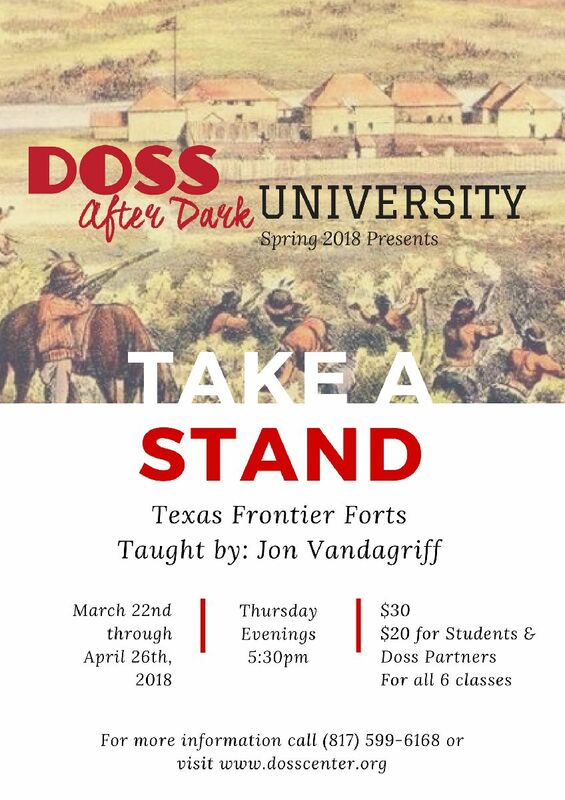 Doss After Dark University with Jon Vandagriff returns this Spring with a six-session study of frontier forts and their relationship to Weatherford! The course begins on Thursday March 22nd and continues until April 26th. The Class is held each Thursday evening from 5:30pm-6:30pm. Jon Vandagriff, a retired daily newspaper editor and college history professor emritus, will be teaching the class. In addition to his 34 yeas of public and college teaching, Vandagriff is the author of two books on Parker County history and is currently completing the history of Weatherford College and its 150 years of educating. The Frontier Forts Class will give a history of each of the forts and will discuss its place in the development of west Texas. Each of the forts played a unique role in helping the settlement of the area. The First line of forts was begun in 1848, just afte Texas became a state. Three lines of forts were established beginning with Fort Martin Scott, just out of Fredericksburg. Fort Worth, which was established in 1849, will be the first fort to be discussed in the class. Fort Belknap at Newcastle, Fort Griffin at Albany, and Fort Phantom Hill at Abilene, Fort Concho at San Angelo, and Fort Sill in Oklahoma will draw special discussion. Because of its unique location on the very edge of the western frontier, Weatherford was the ending place for early movement west and the starting place later for settlers going farther west. Each of the frontier forts has a history of its own in addition to the part that it played in the overall story of the west. Without them, west Texas would not be what it is today!